All AirTec Lube-Shuttle® Grease Guns are made of the highest quality steel tubes with corrosion resistant zinc plating. The comfortable lever handle gives the user the ability to push grease into tight fitting pins where a pistol style grease gun cannot provide a high enough pressure. Working pressure is over 400 bar / 5,800 psi, maximum pressure capability 800 bar / 11,600 psi approx. TÜV, DLG, BLT approved. All products are made in Germany, guaranteeing the highest quality standards! -Environmentally friendly as the cartridge is recyclable! -No Air Release Necessary and NO Air Gap! ALL GREASE GUNS AND COMPONENTS ARE MADE IN GERMANY! 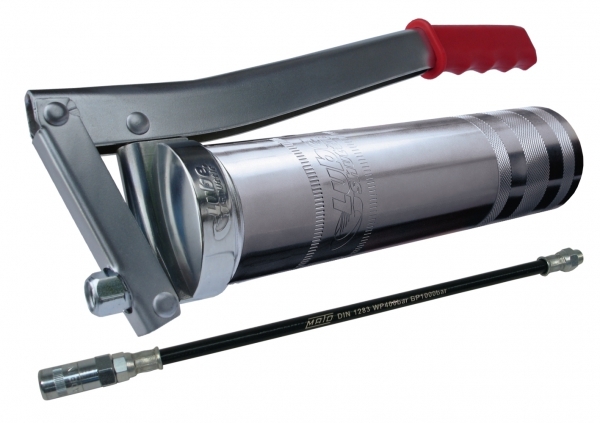 AET Systems makes it easy to purchase our Air-Tec Lube Shuttle Grease Guns online and have it shipped directly to you.